A few threads back, Bat571 opined that the M's should be in the middle of the Bryce Harper scrum. You know, Bat is a wise man and he's right. We should be in. With all the Padres talk, and that of the White Sox, Cubs, Phillies and just about anybody else, it now appears clear that several "mystery" teams have done more than inquire about Harper. It has also been reported that the Nationals actually offered Harper a 10-year deal for more than the $300M that has been reported. But here we are, closing in on Spring Training, and Harper has no deal and those "mystery" teams are sniffing around. Both would indicate that ten years, the contract length he and Boras want, is not going to happen. And if there were a $300M contract on the table right now, I think Harper would grab it in a hurry. It appears that he and his agent may have overestimated just how much (and for how long) he could bring home. I've listened to MLB Radio a bunch over the last week or so, and it seems that nobody there thinks he gets either 10 years or $300M. So if the number of years has fallen to 8 or 7 or 5, then the magic formula is going to be AAV. Harper will want something of a Grande AAV and he will want something flexible, a contract with an escape clause a few years down the line. There is no reason that the M's can not meet those two demands. To wit: After the '19 seasons concludes, our hometown good guys will have right at $49.5M available due to the expiring contracts of Felix and Encarnacion. Well, OK, we may have $6M in buyout costs for those two guys. Still, we have a ton of cash available. And then there is the nearly $28M that is cleared after the following season, when Gordon and Bruce come off the books. Oh, add the $15M from Mike Leake's contract that clears after '20, as well. Seager's contract we're stuck with. All the other lucrative contracts that we have are entirely easy to dispose of. But beyond that, really the only two young guys that we have who will get rich in the next three seasons are Mitch Haniger and Mallex Smith, and the both of them are easily swapped out, in a hurry (more below). So there will soon be money available to spend, lots of it, even by the Mariner's usual thrifty fashion. So a shortish contract, with an easy opt-out and a Himalayan-high AAV is entirely possible for the Mariners to manage and just might be enough to get the interest of Scott "Beelzebub" Borus. And here's the reason why we should consider it: Bryce Harper is a HOF type LHB vs. RHP. The guy creams righties. Minus his one injury shortened season, Harper has never OPS'ed less that .833 vs. RHP (and that with a .391 OBP), has twice been over 1.000, and has a career number of .944! To give you a contextual sense of a career .944, Willie McCovey's career vR OPS was .926. He's in the HOF. Ken Griffey, Jrs.' was .936. He's in the Hall. Big Papi's was .981, He's going to the Hall. Larry Walker's was .993 and he played in Colorado! OK, he's not in the HoF, but he played in Colorado! Figure him for 100 OPS pts less if he played elsewhere. Harper is better! 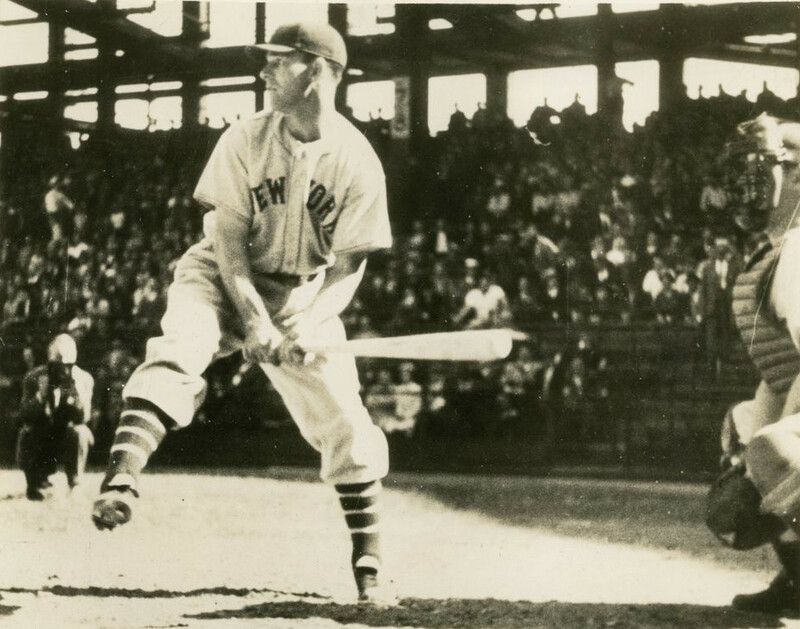 And Mel Ott's career OPS vR was .950. Harper is sort of an Ott. Or maybe he's sort of a Junior? Take your pick, I don't care. Junior slugged .554 vs. RHP. Lest you think that Harper's numbers are built upon BB's, he has slugged .543. That's Mel pictured above, by the way. Tom Emanski, hitting video guru, would be appalled at Ott's stroke. Well, stuff it Tom; Mel knows best. All of those LHB's named above were productive long after the age of 26, which is where Harper is right now. Harper isn't going to fall apart guys. He might be sort of a dink, or a World Class one (which I'm not quite buying) but the guy can beat up RHP. He had a terrible dWAR last season but that was mostly due to the fact that he had 59 starts in CF. From '15-'17, when he was almost exclusively a RF, he was a (combined) -0.5 fielder. Over three seasons, that's about a 1.5 drop from Haniger. Peanuts. Oh, by the way, Jose Altuve has a career OPS vs. lefties of .887. Mike Trout hits lefties to the tune of .940. Harper is better vs. RHP than Altuve is vs. lefties!! He's Trout's equal, in that regard. OK, Trout does hit 1.006 vs. RHP. That's why he's on the very very short list of the greatest RHBs of all time. Add it up how you want, but Bryce Harper is a generational RHP-ripping talent. Manny Machado, seeking a huge payday himself, hits left-handed throwers at an .816 rate. OK, he plays SS, I get it. Gimme Harper instead: Every day and twice on Opening Day. Some team is going to AAV Harper to the tune of a $35M-ish payday. They are going to have him locked for for 4 or 5 years with a Player Option for the next season. That's my bet. Maybe 6 and 7. Something like that. Why not make it the Seattle Mariners? Bite the bullet and pay him $25M this season. Give him $45M next season. Give him $30M and $35M the next two seasons with a Player Option for the following. He collects nearly $165M over 5 year and then goes out for another contract. If you only have him for 4 seasons, big deal, we're supposed to be competitive in '21, anyway. We've now got young guys in the pipeline, OF bats poised to be MLB-ready by the time he and Haniger make their escape. If Smith makes too much in three seasons, big deal......we have plenty of young CF's down on the farm. Heck, if you need arms, trade Haniger for them: Like it or not, he's not Harper.....and he's mostly likely going to be gone about the same time, anyway. The Felix and EE money allow you to do it. Leake, Gordon and Bruce go away soon enough and then you spend that cash elsewhere. Harper CAN be a Mariner. Let's see Jerry pull a Jedi mind trick and make it so (mixing SciFi metaphors, I know). I'm with Bat571. We're not real GM's, but we do play them on SSI. I mean you mention Trout who's an obvious target in 2 years. Betts and Trout could both come free that same offseason. Betts is .936 VsL/ .874 VsR. He had a .917 VsR in 2016 and 1.037 last year. He's 26 now but won't be a FA until he's 28. With numbers similar to Harper except without the fragile seeming batting average. With Betts I would have more concern about his slippage related to home parks, same with Arenado. In either case it's still worth it, you've got to have RHB as well. Harper could fit the park best out of all options of any of now plus the next 2 offseasons. Nonpitching options. Sale, Cole and Bumgarner are all expected FA next year. The year after we could be talking about DeGrom, Hendricks, Robbie Ray, Julio Teheran or Taijuan Walker or Graveman, Stroman, Gausman, Bauer or Chatwood for that matter. Is Harper the one you have to have? The minors are stocked in outfielders and not really anything else. I suppose you could trade extra as options prevent themselves for other needs to be filled. If you've got to trade Haniger, JRod or JKel before the 2022 season so be it. Harper now and Trout in 2 sounds even better. Except they play positions that could block our 2 highest ceiling prospects. Which is also to say we have hopes to approach their production for practically nothing for a few years. I'm not convinced either way on getting Harper or waiting until needs are better known. He's the only LHB coming up on free agency that I'd really want. I don't think Dipoto is likely to be betting on an inability to produce on outfielder out of all this talent in the next couple years. It seems like an infielder like Machado where the depth is thinner makes more sense. I'm happy with either signing or with the team keeping that flexibility for now. They could probably swing signing both and only be into luxury tax 1 year, not that I think they should. Edit: I think Harper will still be good at 35 (10 years) and personally wouldn't balk at 10 if the AAV was reasonable. Not as certain about Machado although Mochado seems to me to have a likelier defensive value. which I think is being underrated at SS. Last year he got his first negative defensive ratings in a small amount of innings at his first time playing mostly SS since he was 18 in A-ball. So I dug deeper. 8th in 0-10% at 5.6%, only 11 players even made 1 of these last year at SS. So, I think he's a solid and good SS defensively, given more reps back there to reaclimate. If he isn't already. Or maybe he'd be okay being Zobrist+? And no thank you. Its a tough trigger to pull. I have, like many others, wondered if Dipo was shedding Cano money to make way for Harper. All the points made by moe are true and would really bring a buzz. The team has proven its not 'afraid' of big money, long term deals. I really can see the effort to have a ten year deal for a 26 yr old instead of a 30+ yr old. 10 yr deals may be a thing of the past, but if 8 gets it done..a lot of teams should be in. It seemed to me that several years back we struggled vs. lefties so the team focused on getting better at hitting lefties, which kinda worked. Nelly, Haniger, and even Seager were our answer to the LHPs we face. But....when 60-70% of pitchers are RHP and your kinda bad against RHP....it doesn't bode well. That's my opinion/view of our lineup for the last couple years...focused hard on defeating lefties....40% of the schedule...just not enough daggers for the rest of the schedule. We NEED a RHP killer. Alas, my mind always wanders back to Sale, Price, Porcello (ok, not his best in'18), and Kuechel, Verlander, Cole, and Kershaw, Wood, Hill, Buerhle and maybe we have some guys about to explode onto the scene...but even if we signed Harper, we would be the Blue Jays from a couple years back (2015-2017 they DID make the playoffs tho) will mostly offense and not enough pitching...but so cries every team. Sorry for the rambling thoughts. I do think he fits well here, but so do alot of people for that money. A Haniger, Smith, Harper outfield would be fun; can't argue with that! Thanks for keeping the good ship afloat! 3B: Seager. Death by shift. DH: Jay Bruce, but Encarnacion, if here. I think we trade him before Opening Day. We will eat a bunch of salary, of course. But he's easier to trade than Bruce, I think. If you buy down almost all of Bruce's salary for two years, then you can trade him. I've been advocating that for a long time. If you keep both Bruce and Encarnacion, then there is no way you keep Vogelbach, unless Bruce is your 4th OF, which is defensively disturbing and developmentally ridiculous. So I suppose I should say our DH is Jay Bruce. To keep Encarnacion until mid-summer, thus dumping Vogelbach, would be sort of insane in terms of building for the future and giving a guy a shot. I might scream, as well. Basically we need to give one of those guys away. So that would be 10 guys. Healy we shuttle off to Tacoma and ask him to not K so freaking much. In Tacoma he will go head to head with Joey Curletta. That will be fun to watch. So those 10 would leave us in need of a 4th OF, a SS/2B and another guy. 4th OF: As currently rostered it should be Braden Bishop. I would love to see this. L-O-V-E. He plays CF with glovey elan, is probably a GG guy in LF and is due the shot. That's the way to invest in the future. Somehow I think we blow this one, along with mucking up Vogelbach, too. The way to not blow it might be to sign a cheap MLB guy who plays all the OF positions. But if we're looking toward '21, then Bishop should be the guy. 2B/SS/3B: Dylan Moore. We gave him a MLB contract for some reason. This is it. #13: Maybe we keep both Bruce and Encarnacion. Bleh to that. The Opening Day best call is to keep Negron up until Crawford gets 25 games in Tacoma, at which point he's our SS and Beckham inherits the Utility role. That's pretty lefty dominated: Dump Bruce and it gets better. Worthy of consideration: Right now, the Padres Wil Myers is owed $73M over 4 years. Kyle Seager (for the Padres) would be owed $71M over 4 years. The Padres 3B looks to be Greg Garcia, unless they play Myers there. Or unless I am missing something. I have no problem swapping Seager for Myers, playing Myers at 3B and even paying the Padres a big chunk (or all) of $15M in '22 to cover the Seager cash, as a trade makes his '22 season a player option. The Padres habe young OF'ers in spades; Myers is very expendable for them. Seager will bounce back some, but the shift has erased the Seager of '14 and '16. With Crawford and Healy in Tacoma and both probably coming up around the deadline together, as space is created. Beckham trade seems likely at that point after building some value. That means that White is spending the same time in AA though or Healy is bench/Util in Tacoma. I think Encarnacion is going to TB or Houston once they find their offers to the big bats weren't accepted. The Lefty Bruce it sounds like is much likelier to make it to the deadline at least. Expect him to rival Seager for shift quantity if he's playing. With Seager, what is it about 2014-2016 facing the shift 200-300+times with BA of .367, .303 and .300 that just isn't working anymore? Mostly I see line drives becoming flyballs. At this point I see Myers as a bat first utility player. Seager is only here through 21 if they buy out his option. Your proposal adds up to basically adding $22.5 million Myers contract plus $15million to SD minus the $3million Seager buyout plus the $1 million buyout for Myers is about $34. 5 million added for 2022. For what seems like a downgrade on both sides of the ball aside from getting 3 years younger and significantly faster? I would not play him at 3b every day either. I'm not sure but Healy might be better there defensively. Are you just certain Seager is cooked? I figured Noelvi as the Seager successor. The fly in the ointment this year is starting in Japan. Thus, I believe the M's get to keep a 27 man roster for the time there, and maybe even a until games start back in the US... which will add ICHIRO to the mix... and make this team even more left handed. With that said, I am confident the back up catcher is not on the roster yet. Further, like you said, I expect a trade to break up the log jam with Vogs, EE and Bruce... but I don't think we will like the trade. Teams know that Dipoto MUST do something, so not much bargaining power. It will be interesting, and I'm betting someone will get injured... but not sure if that will make the selections any easier or obvious. I am with you Tacoma. I want Harper, but my ”likely roster makeup” riff was based on the idea that I don’t think we go get him. I Should have made that clear. Thanks for coming back. I appreciate the reply. I totally forgot about the Ichiro deal. Drats. As to not liking a Vogs, Bruce or EE trade, any swap of the last two is fine by me. Unless we buy big between now and ST, in an effort to compete this year, then EE and Bruce are simply in the way. Move one of ‘em out! BTW, if we are looking for a cheap-ish and professional 20 starts, we could do way worse than Clay Buchholz, who remains available. You could probably get him for $10M over two years. What I meant by a trade of Vogs, Bruce or EE is two fold. First, Vogs might be the one traded. Two, Dipoto might have to do another package deal like he did with Cano, where he trades away Haniger... or something of bad contracts like Bruce and cash to the Giants for Samardzjda. Further, while I want Harper, I just do not see any way that Haniger stays a Mariner then. Haniger would have to be used to trade for pitching and fill a hole like C or mid infielder... because at that point, Dipoto is going for it this year. Then as far as a flyer on a pitcher, many linked E. Santana early in free agency to the M's... and I have heard a couple mention Shields lately, but I could live with Clay. I have sometimes thought that TB likes our Vogue. I think not knowing which teams are getting which bats is the hold up. The teams that want bats have Harper and Machado higher, with reason. It comes down to who misses out. Encarnacion and Healy I think are both expendable. https://www.mlb.com/video/smith-steals-home-in-the-2nd/c-2478825483 on a pitcher's mind. Also after reading and looking and watching on Sheffield and Swanson I'm not sure we'll need any more arms for the rotation immediately. Certainly some depth is required and I can see 2 strong points for bringing in a stronger bounceback candidate. Depth and deadline value. As for what's in the rotation going into '20 with Yusei, Marco, LeBlanc and Leake you already can't fit both Justus and the Swan. Certainly anyone can be traded at any point. I'm entirely ready to start seeing these guys in spring. February 22nd at 12:10 PST vs. Oakland on Root is getting close. Per B-R, Mallex Smith will miss the first “few weeks” of camp with a forearm strain. That give Braden Bishop a whole bunch of CF reps and maybe an inside shot at breaking camp with the big league squad. Kyle Lewis and Don Thompson-Williams will likely get a look-see as well. I'm excited to see the kids play! What are the chances that one of B Bishop, K Lewis, D Thompson-Williams, even I Miller or J Fraley sets the AZ world on fire and goes to Tokyo as one of the 28? You know, two years ago M Smith was in their situation... we needed to add a couple of nearly MLB-ready SPs to trade him for a year of Drew Smyly; now, the sky will fall if he's not ready to play against the A's in four weeks. I'm excited to see who emerges out of the pack! I, for one, am excited to see the kids! If Mallex Smith is not throwing or swinging the bat, here four weeks from Opening Day (just now being evaluated for running and fieldng) then chances are he does not travel to Japan, in favor of someone who actually can perform those important tasks for a center-fielder! Assuming we don't go out and make a "silly" signing that would push back everyone in the queue (and thereby limit the kids' development), then the candidates to play CF in Tokyo are Mitch Haniger, Braden Bishop, Ian Miller, and possibly Kyle Lewis or DTW. I'm pulling for the local kid- the UW prospect, who contributes to core Alzheimer's for every base hit- but excited to see how each of them takes advantage of their unexpected opportunity! I've seen it suggested that the Mariners' roster is pretty well set, coming into the Cactus League season. We have five starters penciled in, we know who will start in seven of eight field positions. Assuming JD cannot find good homes, and good deals, for Edwin E and Jay B, then they start out on the roster and get plenty of ABs, to maximize their value to a contender in July. 1. Who plays backup catcher? a) David Freitas, b) Jose Lobaton, c) AJ Ellis or Martin Maldonado or someone else well-suited to developing a young pitching staff, who is not yet in camp. 2. Does Ryon Healy stick at first, or do they take advantage of his option and give him "seasoning" in Tacoma and play Vogs/EE/JB at first? Remember... if Vogs doesn't go to Japan, he's subject to waivers. 4. Can we live with a bench of Freitas (or another backup Catcher), Morris (or Negron), Bruce (filling in in LF, 1B and DH) and Vogs (filling in for 1B and DH)? We're sacrificing. OF defense, leading up on LH power. Of course, any injuries in camp (such as M Smith's strained "flexor bundle") throws everything off. I still expect to see B Bishop on the plane to NRT, possibly with M Smith staying in AZ taking BP! Here are my best guesses to your questions above. 1. Back up Catcher - I do not think the player is on the roster yet. Hoping for Maldanato, but expecting someone like Jesus Sucre. 2. 1st Base - I expect Healy to start in Tacoma. I expect Vogs on the roster, but to get cut the first week back from Japan... and hopefully he will get through waivers. I'm expecting a lot of Bruce at 1B. 3. UTL - I'm expecting Morris, but as you said this is mute come June when multiple changes are made. It could be Shed at that point. 4. Bench - I'm not sure the M's will have a 4 player bench when they start in the US. My guess is a 3 man bench and extra pitcher. I think Ichiro sticks through May as 4th OF, with DS, MS and MH as the main OF... so OF defense will be pretty good. So bench of Back up C, Morris and Ichiro. Outside shot for Vogs, but I'm not convinced that Servais actually wants him. B-R did indicate the other day that the M's were looking to add a MLB -experienced catcher, on the cheap. Vogs has to make the Opening Day lineup, has to. I can't believe we option him out, knowing he will get a shot somewhere. And I can't believe we get much in trade for him. As I've said before, keeping Bruce over Vogs is a totally stupid move. Bruce is a sunk cost and the chance that he brings us anything nice in return is pretty slim. As to our extra OF, Ichiro certianly comes out of ST on the roster....but I think there is a bit of a shot that our 4th OF isn't Bishop but could perhaps be Ackley. Ackley played 1B and 2B (as well as LF) last season in AAA. He hit .298-.387-.403 vs. RHP, as well. 1. I think you're right about the Ms' Backup Catcher... we have not yet met him! 2. I like the idea of Healy down south; Vogs on the roster to Japan. I hope, in 4-8 ABs in Tokyo, he does not embarrass himself and cause JD to remove him from the roster. I hate the idea of the Ms losing him to the Orioles, Royals, WSox or some other lame franchise that can afford to keep him and let him develop. Just for the record, I like Vogs... but I doubt we ever see his best in Seattle. There is more depth at 1B other than Healy, Vogs, EE and J-Bru... Curletta - the M's Minor league player of the year will also be in Tacoma, as well as Ackley and Filia. And remember that White should start in AA. As for the bench / pitching staff... King BC explained my point well below... With Kikuchi & Felix starting, and more than likely the season starts with a Rule 5 guy in the pen, and it being early in the season pitchers will take time to build up arm strength & stamina again, and the only guy with experience throwing 3+ innings in the pen being Elias... there will be plenty of innings that will need to be eaten. Furthermore, based on lack of options and assuming Swarzek is the only one that starts on the DL... The Pen will be CL- Strickland, Set up- Gearrin, Armstrong & Rumbelow with Rosscup as LOOGY, and long men Elias, Brennan and Bradford. None of these guys can be sent down without passing through waivers. Thus, who gets axed will get interesting when Swarzek, Tuivailala, Bautista, Festa and Altavilla are ready to come up. As for Long, I like what I see so far, but I really hope they do not rush him. Long has not had an at bat in AAA yet, and really only has half a season in AA... so let the kid develop into a monster. That way he can replace Gordon next year sometime. Check out the Ms' 2Bs through 10.5 innings: five for six, with three doubles and two singles, spread across three players. SHed starts out with four bases in two ABs; TImmy Lopes (remember him?) with four bases spread across three ABs, all of which put him on base. Even Dee Gordon got into the act- a BB on his first AB (like hens' teeth, last year! ), an SB, and plating on MH's HR. C also produced: The Ms' top three catchers all have had base hits. IN fact, just about everyone got into the act except Ryon Healy, the only player written in on both of Scott Servais' lineup cards, who has yet to get on base. How cool to see Kyle Seaver batting 1.000! We need a bounce-back year from him. And- like the looks of the Ms' young outfielders! Who knew about TIto Polo, with base hits in both games and a spectacular running catch in CF (although he may have made it look more dramatic than he needed to- just saying). Like most on here I hope we pick up Maldonado to work with our young pitchers and also with Narvaez on his defense this season unless they are completely sold on Freitas. The M's will be forced to use a three man bench and eight RP's (13 pitchers/12 batters) with the stated desire to be creative in reducing Kikuchi's innings and needing the extra arms for bullpen days. That means they can not carry both Healy and Vogs past Japan. They can only keep three of these four players on the 25 man roster: EE/Bruce/Healy/Vogs. It means a trade/injury in the next month or it's Healy as the only one with an option at AAA. The three man bench is the backup Catcher, Jay Bruce and at INF either Dylan "Moore" or Negron presumably until JP Crawford takes over and makes Tim Beckham the utility guy as has been mentioned. I hate seeing Mallex Smith miss the entire spring training and all those at bats to get ready as our possible leadoff guy. I've never been sold on B. Bishop's high prospect ranking (wanted Ian Miller to breakout) but am excited to have the local guy prove me wrong while he fills in this spring. Hoping to see some great defense/baserunning and a not abysmal OBP from him. Dog, I'd love to see Ackley play his way back onto the roster! Not at the expense of Vogs, but... he could back up at IF (1B/2B) or any OF. Honestly- while Edwin and Jay may contribute to a fast start this SPring, the sooner we can ship them (and their bloated salaries) out of town, the sooner we can free up those roster spots for the kids. In fact, their presence on the roster may be the clinching factor in the decision about how many pitchers vs. position players to carry. Carrying those two big contracts- those "past their sell-by" veterans- requires mitigating with some younger more flexible talent. Will Jerry find room for E-Enc AND J-Bru AND Vogs? A lot of "good hit, no field" talent there! If we let Vogs go just to keep Bruce, then the front office is betting they can get a better return for Bruce than Vogs, if Bruce hits for 3 months. I just don’t Think that is a great bet. I would simply eat Bruce’s salary and release him. But Dipoto and Servais have talked about the value of Bruce in a leadership role which I can understand. I think it comes down to Encarnacion not getting moved yet because potential partners still have offers out for Free Agents who they'd prefer to spend on. The hope for me is that he gets moved during spring, but I'm pretty sure he could play the 2 games in Tokyo without Vogs having to be put on waivers even if Daniel stayed behind. Teams always have injuries in spring too, a fit for a trade might present itself that way. Between Bruce and Vogs, if both were to put up 3 months of production and then get traded I am pretty sure DV would have a higher value once all things were considered. Speaking of injuries, Smith is in a situation that I think you need to make sure he's ready before relying on him. Healy missed most of spring last year, tried to play catch-up all year and it just didn't work. He wasn't leading off. If we are able to swa out EE in spring training that would totally fix the Bruce issue. I'm all for either he or JB moving elsewhere. If Smith is unable to go on Opening Day, then you could sort of keep Bruce with more of an active OF role, to go along with 1B/DH. Makes it seem like at least 2 teams are still trying to get him. Whoever does not get him could have Encarnacion 2nd or possibly something else. Harper is maybe there too as suitors who could see Encarnacion as a partial backup plan, though less likely. A team wanting Harper might want both a bat now and an outfielder of the future. That's a depth the Mariners might trade from yet again to get the package back they wanted. He'll probably be severely discounted this year for the the acquiring team. The opportunity to be sure about Vogelbach is worth a lot all by itself. Vogelbach at 25 last year had 90 BB overall (AAA+MLB) 20.4%BB/15.6%K in AAA with .290 BA and .545 Slg%. This despite coming up for a 2 game spurt in May (5 days on roster) , 1 game in June (7 days) and 2 games in July (over 10 days. Total: 5 games/20 days split between 3 months[Take that, rhythm!]). His 2018 shot in the majors was 5 stretches combined of .204/.324/.368/.691 an OPS+of 91. 102 scattered PA that puts him at 146 for his career. He currently sits only 16 PA past eligibility for ROY. At 24 he got 79 BB overall with 14%BB/18.1%K in AAA and hit .290 in AAA despite similar though less overall MLB time. At 23 he got 97 BB overall with 21.2%BB/17.2%K and .292 BA in AAA, a third again his previous high, Slugging .505. That can play even with less frequent power. Pairing the lowest of BB and BA of Vog's last 3 years in mostly AAA with .290 BA and 73 BB is something Encarnacion has never done anywhere, his .315 AAA BA was accompanied by 33BB in 1997, 50 even including MLB. Rather 14%BB and 18.1%K, which he also hasn't ever surpassed together. Who seems like a safer bet to you in T-ball park, the 26 year old lefty or the 36 year old righty who had worse MiL offensive numbers in a higher offensive era? At 24 in 1987, between AAA and MLB Edgar accrued 84 BB hitting .329 and slugging .479, both other than slugging (.490 previous high in >20 Game stretches) far better than previous highs. At 25 Edgar combined for 70 BB, hitting .363 slugging .517. Both seasons with similar MLB bench caveats to most of ‘Bach's time. At 26 Edgar struggled over 3 stints in the majors at .240/.314/.304/.619 an OPS+ of 74, and got sent back down. At 23 in 1999 David Ortiz had 84 BB Combined with 14%BB/18.7%K .315 BA, slugging .590 in AAA. The BB total being over half again his previous high. At 24 he struggled in the majors hitting .282/.364/.446/.810, an OPS+ of 101 and got sent back down. Last year Encarnacion, Gallo and Choo had .810 OPS with OPS+ of 115, 107 and 112 respectively. I’m not suggesting Vogelbach is a hall of Famer, just that he seems not far behind a couple of the best at his position in not making outs at a similarly young age in AAA. Sitting him far more than he plays then sending him down a total of 4 times over a season doesn't seem like it would instill much confidence. He's already struggled in many different short stints. I merely want to see him given a chance if this year is really about the future. As a lefty in T-ball park he could be so much fun to watch for awhile or longer if he puts it together. Bringing us back around to the title. BOOM! from the left side. Edwin got off to a hot start, but cooled off today. Meanwhile, Jay Bruce picked it up with two solid singles today. Frankly, I don't care which one goes- EE or JB- I just don't want to sacrifice our future to carry a bloated contract or two into the seasion. I missed the homers by the young guys. Turned the game off as I had places to be. I saw JB's 1st single, a frozen rope. I thought Vogs looked really good at the plate...even on the KC. He owns the zone. Bishop looks good in CF and Haniger made a great play in RF. Oh...and Gonzo looked really good. C: David Freitas is hitting! Joey deCarlo is hitting, and walking, a bit. Everyone else- not so much. If our new starting catcher's calling card is his OBP- it has not shown up, thus far. 1B/DH: Vogs! HR, and 2 BBs, today. Healy, mercifully, took the day off. EE and JB also did not swing bats. 2B: The Shedster got on base and scored, with no errors. Timmy Lopes came back to earth, a bit. SS/3B: Kyle Seager is hitting! Kyle Seager is going the other way! Kyle Seager is skinny! Tim Beckham hit today. Moore and (particularly) Negron have not distinguished themselves. Neither, frankly, has our new shortstop- although it looks like he will get a few months in Tacoma to sort himself out, before we depend too much on his bat. Bobby Honeyman made several pretty plays at 3B in the closing innings yesterday. OF: Jerry looks like a genius (1 wk in) for swapping Ben Gamel for Dom Santana, nearly straight up. Kyle Lewis looks like "Mercer Univ." Kyle Lewis. On fire! Braden Bishop, Ian Miller, Tito Polo, Jake Fraley, DTW... we don't need very many of them to come good, before we're on to Jarred Kelenic and J-Rod. Marco and YK look "ready to go"... to Tokyo. Bring on the A's! Leblanc and Leake look serviceable. I'm all in gavor of the suggestion from a competing blog that we see whether the lowly suddenly-respectable Friars might be interested in taking over Mr. Leake's agreement, in return for a couple of pulls from their MiLB system: one SP< and one 3B/SS prospect. Everyone must be impressed with what they've seen from Justin Dunn! However, he is subject to the same service-time concerns as J Sheffield. And, his value won't be maximized in the 'pen (although that could be his fastest path to the majors). On the port side, Zach Rosscup looks like the REAL DEAL. If he can stay healthy- that has been his hangup in past seasons- I think Jerry hit the jackpot. Roenis Elias, on the other hand, hasn't looked as strong at the beginning of 2019 as he did closing out the previous campaign. I'm not yet convinced he's our guy for spot starts, long relief, or mop-up duty. Does Ricardo Sanchez go to Tokyo, in the LHRP slot? From the starboard side- good outings from H Strickland (our presumptive closer), D Altavilla, S Armstrong. Many of the others expected to challenge for 25-man roster spots have un-impressed, thus far: Alaniz, Bradford, Brennan, Festa, Gearrin, Rumbelow. ONly Bautista has shown from among the RHRPs. Oh- and I've been impressed with Robin Leter and David McKay (the two arms who finished up today). But we may end up signing a FA- or, scanning the waiver wires- to fill out our bullpen. Some of the relievers with "soft" first outings looked much stronger their second time around. The guys who have been hitting- didn't hit. The one guy who distinguished himself was our friend Vogs, who had two hits and a walk. Meanwhile, his primary competition at 1B, Ryon Healy, still is seeking his first AZ hit. In every PA of Vog’s, that I have seen, he looks like a guy with a plan: I am not swiping at balls; I am trying to hurt strikes. I can’t see how he doesn’t stay with us. Healy looks like a guy heading to the wilds of Tacoma. I still can’t see us keeping both Bruce and EE, mostly because of what it means in terms of Vogs, but also it would likely mean that Haniger opens the season in CF. We’re 11 days from flying to Japan and just 17 days from Opening Day, Mallex Smith is still a no-show and appears very unlikely to make that trip. It also seems that we aren’t going to grab a vet catcher, or if we are, it has to happen soon. We also need to stretch out whoever our SP’s will be in Japan. I was sort of glad to see Shed Long have an o’fer, just to help Servais not make a rash move and keep him. But it depresses me: He lists Vogelbach as having only a long-shot's chance of making the Opening Day roster (recognizing that 28 players can travel to Japan) and he lists Healy as a total lock to make the OD 25-man. Both of those things bug me to no end. Sigh. As well, he says that Bishop has no chance at making the roster. Sigh. That would mean that Haniger likely goes to CF for the two Oakland games across the Pacific. Well, it could be Gordon with Moore going to 2B. Dog, I have the same reaction. A part of me is thankful that Jason Churchill doesn't decide the final roster cuts! But I'm sure he's closer to the folks who do, than I am. Seems morbid, but I find myself "rooting" for 1B/DH injuries. Surely somebody- TB? 'Stros?- needs a DH with a brilliant track record over the past five years?! I don't know how to create a poll, in Klat- but I'd love to get everyone's updated reactions to our "Winter of Trades", midway thru Spring Training. If you're willing to play- please score the following deals, out of 10 (10 means Jerry nailed it; 1 means he got hoodwinked ("taken to the cleaners"). I have my scores in my head- I'll give you a few days to mull this over, and supply my own views at the weekend. C. 6, because while I know trading Cano was near impossible, taking on so much salary back while giving up Diaz... maybe a 5.5... but goes up if/when Bruce gets traded or cut. D. 5, again mainly because I don't understand why Segura would have been viewed by Philly or any other team as toxic, especially at that salary. I have not seen Crawford yet though. G. 6 but going up, because this team needs power in 2020... hopefully he is it. H. 4 if Shed is utility guy, but 7 if starting 2B in 2021... and I think he starts. Because I'm basing some of my reviews on hot springs at this point. Jake Fraley was not supposed to be the best player in this trade. He may not be but he sure looks it as you're asking. Pretty sure Paxton (considering seeming inability to stay on the field) isn't the best player in this trade either. Ignoring perfection, his numbers are starting to look a lot like Bedard, except less innings. At least he's the Yankees Bedard. A guy with only 2 years of control and a 3.8 bWAR high should not bring this kind of return. I know Cano has the career numbers and Diaz is a beast right now but Kelenic could wind up being the best player here. I wonder if Kelenic was even on the table for just Diaz. Crawford is one guy really not looking good right now. Segura's/Santana's/Encarnacion's return is currently in limbo due to the 3rd leg. 2 years of a very good setup man for 4 years of a good Starting catcher. Reason to hope for more. There's not much available talent at catcher. Same Incomplete from the 4th trade except it now includes an unknown pick and a DH logjam that needs alleviated. If we were stopping with one I think Santana was the better answer. If they turn Long into the super-sub he seems capable of becoming, Stowers could have a hard time surpassing that. Not probably too hard for his talent, but how many OF can you use? Dipoto moved excess talent to an area of greater need closer to the show. I gave 4-9's, a 7 an 8 and 2 incomplete. 8.5 average over the 6, but the other 2 will eventually get lower grades. I'm hoping to eventually see in Crawford what scouts always have but expect both the incomplete to eventually bring the average down. Blocking Vogelbach in the "stepback year" when he's out of options and has owned AAA for almost 1500 PA, deserves negative points attached to each trade that caused the block. The only way that Vogelbach makes it is if a front office projects him as an Edgar-Cruz-Big Papi sort of bat. And those guys brought some glove value early in their careers. But if any team has the opportunity to test his bat, isn't it the 2019 Ms? BTW, Atlantaq is in danger of getting lapped in the NL East AND they have some tweaked arms. if we're not dangling Mike Leake there way, we should be. Ditto Philly. They've made the big investment but still could use a solid and consistent rotational add. We have one for them. SD needs for similar reasons to Philly. It's worth noting that the Mariners are kind of using Leake as a veteran pitcher role model and he's one of only 2 Non-Felix RH anywhere near to the rotation. Swanson could be next up but most other options are LH. Swanson's readiness deciding Leake's availability makes sense to me. Not that they shouldn't take the right deal as soon as they get it. We must be twin sons of different mothers; our ratings are dang near the same! From MLBT-R, about Mallex Smith: Mariners center fielder Mallex Smith has been sitting out the early portion of camp due to a strained flexor mass in his right forearm, but doctors have cleared him to begin baseball activities, Greg Johns of MLB.com tweets. Smith has already played light catch and will begin the process of getting himself into game shape. It’s perhaps a stretch to think he could be ready for the team’s two-game set against the A’s in Japan on March 20-21, but he still has a bit more than three weeks to prep for the Mariners’ home opener on March 28. It's getting harder to keep him off the Japan roster all the time. And let's just cut bait on EE, please. He's not done, likely, but he's not of any balue to us, unless we hold him for part of the summer and find the perfect trade partner. Even then, we don't get much for him. Hey Moe, Not buying the projections on EE (e.g., B-R has 29 HR and .818 ops), or do you think someone on our roster will do as well or better? To keep them both, it seems like we have to give up Vogelbach, as we can't send him down (somebody grabs him, he is out of options). So the question to me is whther any trade return for EE or Bruce is likely to exceed Vogelbach? I'm not seeing that. We can travel with 28 guys to Japan. Ichiro is one of them (I wouldn't mind if we kept Ichiro for the full season), add Bishop and somebody else. Not counting Vogelbach, Bruce AND EE makes 11, Crawford makes 12, when he's available. You can keep Vogelbach, but then you are really keeping 3 1B/DH types, considering that Bruce isn't really much of a COF, anymore. Dylan Moore and Bishop get frozen out. I would really like to see us put Bishop in CF for the two Japan games, and then keep him up as the 4th OF. So keeping EE is really a bet that you can enhance his value enough to trade him for a better prospect than Vogelbach. I'm not really into that whole bet. Many of us were on board... now, sounds like Jerry is, as well. Welcome back, Doc! This place just isn't the same, without you!